Switzerland, December: Got back from Thailand the other day, still jet-lagged. Writing this because I see, out on the balcony (7th floor), there’s a pigeon and it’s just sitting there, with folded wings, in a small plastic waste-paper bin looking at me. What’s it doing there? At first I think it’s just sitting there because it’s feeling cold or it’s not well. And I don’t pay any attention to it. There are always these birds around on the balcony – it’s because I’ve been feeding them of course. But how long has this one been there? I didn’t notice it when I arrived…. I look again after a while and it’s not moving away from the seated position. Just then, its partner, (husband, wife… mate?) it’s mate, turns up, on the balcony. It has leaves and grass in its beak looking quite picturesque and part of nature here in the urban setting. Could be an excerpt from a National Geographic movie watched by airline passengers at some hour in the darkness. But I’m saying that because I’m still jet-lagged. So, looks like it’s decided to build a nest there, in the Christmas tree pot container. How strange and funny! Some time later, and I’d fallen asleep, woken up and it was a different time in the day: what’s the pigeon doing now? I go to the window and take a look. It’s still there. I don’t have a camera so I’m making a sketch of it. 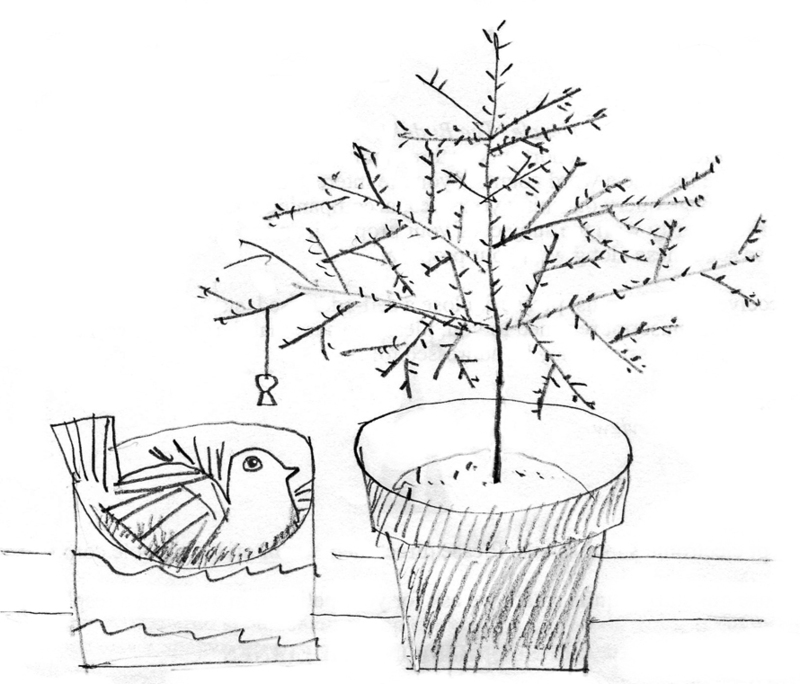 It’s nesting in the waste paper bin that was the container that held the Christmas tree pot (with earth and roots). There’s still a piece of red Christmas paper wrapped around it, stuck with tape and the actual Christmas tree is standing next to the nest with one solitary dangling, gold-coloured, paper-wrapped chocolate bell decoration thingy I forgot to remove when we took off the Christmas lights and put the tree out on the balcony. Then went off to Thailand and left it like that. A day or so goes by and the odd thing is I forget about what’s going on, or I didn’t think that the bird would have laid an egg by this time – I was thinking … I don’t know what I was thinking. Anyway, I was just kind of gazing at it from the warmth of my kitchen, out there on the cold balcony and suddenly the bird got up, hopped on to the balcony rail and flew away someplace: hmmm, where’s it going now? After a while, I slide open the balcony door and go out to have a look at the nest more closely, and, “oh!”, there was this little white egg lying there. An existential moment. There it was, kind of lying on its side in an uncompromising sort of a way. It suddenly seemed alive! Just there… waiting for the parent to come back. I hurry back inside the apartment, quietly closing the door and try to occupy myself, thinking is this what it feels like if you’re going to have a baby? No that’s silly. But I kept going back to the window to see if the parent bird had returned: come on parent bird, you should be sitting there, the egg needs to be kept warm! The last thing I need is a neglectful parent, and slipped back into my state of nurturing memories of a childhood that was not all it could have been – which is something I do from time to time. Of course the bird came back, or one of them did, I can’t tell which is which. It settled down and everything was allright again. I felt comforted. And that’s how the Pigeons came to be on the balcony. Jiab was not overly pleased. There were discussions soon after they came. And later more discussions about how they were beginning to come inside the apartment – in the summer months with the windows open, it was too much. She was completely right! I should never have started feeding the birds out on the balcony all those months ago.